Lydia Hastings married John Ramsdell in Jan 28, 1836. Charles Hastings married Abigail Proctor in circa 1854. Henry J. Hastings married Eliza Jewett in before 1851. Joseph Marshall married Hannah Hastings, daughter of Naaman Hastings and Lydia Whitney, in Feb 13, 1834. Henry Capen married Hannah Hastings, daughter of Naaman Hastings and Lydia Whitney, in Jan 24, 1855 h/2. John Ramsdell married Lydia Hastings, daughter of Naaman Hastings and Lydia Whitney, in Jan 28, 1836. Eliza Jewett married Henry J. Hastings, son of Naaman Hastings and Lydia Whitney, in before 1851. Burial Woodland Cemetery, Cambridge, Washington Co., NY, USA, "Capt. 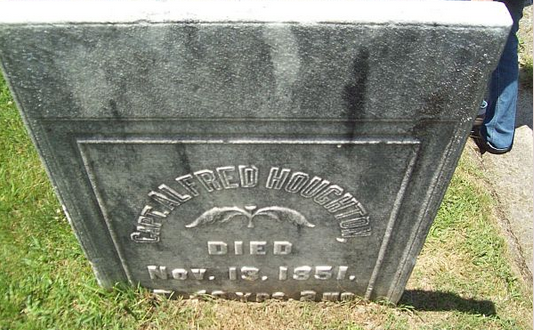 Alfred Houghton, died November 13, 1851, aged 40 years, 2 months"
Capt. Alfred Houghton married Julia Ann Fenton in Mar 3, 1845 at North White Creek, Washington Co., NY, USA, h/1. Ceylon Smith Houghton married Elizabeth Bennett in Jan 11, 1843 at Washington, DC, USA. Marriage Sep 17, 1857 White Creek, NY, USA, JWH: "after death of first husband." Julia Ann Fenton married Capt. Alfred Houghton, son of John Houghton and Elizabeth Willis, in Mar 3, 1845 at North White Creek, Washington Co., NY, USA, h/1. Julia Ann Fenton married Edward Salmon Houghton in Sep 17, 1857 at White Creek, NY, USA, JWH: "after death of first husband." Lucretia Burgess married Edgar A. Witters in Oct 26, 1853. Maria Burgess married Lyman Hobert Burgess JWH: 16 Mar 1835 [???]. Edgar A. Witters married Lucretia Burgess, daughter of Lyman Burgess and Lucia Hill, in Oct 26, 1853. Lyman Hobert Burgess married Maria Burgess, daughter of Lyman Burgess and Lucia Hill, JWH: 16 Mar 1835 [???]. Homer Hubbell married Maria Burgess, daughter of Lyman Burgess and Lucia Hill, 2nd. George Bruce Houghton married Dora E. Brown in circa 1874 at Leominster, Worcester Co., MA, USA, mar 26 y in 1900. Mary Brown Houghton married George Peirce in Mar 21, 1872 no guardianship in 1863 at father's death. Charlotte Elizabeth Houghton married Orin Clare Bennett in Feb 1, 1871 w/2. Marriage License: Riley County, State of Kansas, September 28, 1869. Mr. Alfred S. Houghton of Manhattan, aged 23 and Miss Marcia A. Gardner, of Manhattan, aged 21. R. J. Camper, Probate Judge. State of Kansas, County of Riley. I James H. Lee do hereby certify, that in accordance with the authorization of the within License, I did on the 28 day of September A.D. 1869 at Manhattan in said County, join and unite in Marriage the within named Alfred S. Houghton and Marcia A. Gardner. WITNESS my hand and seal this day and year above written. James H. Lee. R. J. Campin(?) Probate Judge. Minister P. E. Church. Anderson: 29 Sep; Lock Sep. 28. Alfred Staples Houghton married Edith L. Meyer in Oct 12, 1903.